We're a bar food kind of family. We like burgers and wings and french dips and philly cheesesteaks. What do the traditional bar food items usually get served with? French fries. But honestly (I have a hard time saying this seeing as potatoes are one of my favorite things EVER), sometimes I get a little sick of fries on the side. Next best thing? 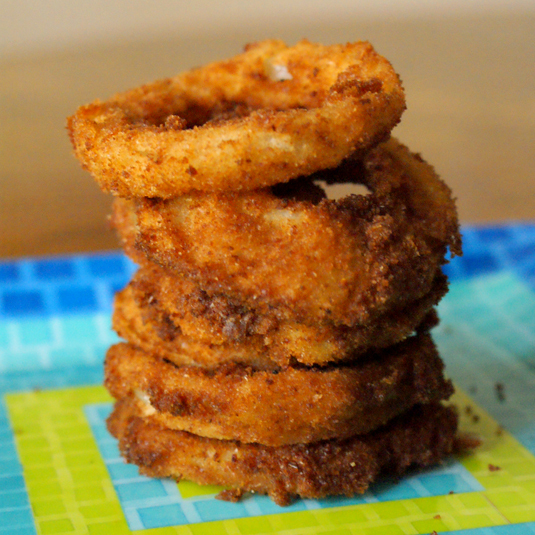 Onion rings! Yes, I've tried the store bought ones, but they were...how do put this...awful. The "onion" part barely seemed like real onion and the breading left a lot to be desired. So, as usual when I'm dissatisfied with the packaged stuff, I set out to make my own homemade version. I tried a few recipes, but none worked for me. I was disappointed when the breading came right off, the flavor wasn't quite right, or they were kind of limp and soggy. Then, I found this recipe. Not only were they delicious and flavorful, they were super crispy. It takes a little bit of time in the preparation department, but the results are so worth it. Heat oil in a deep fryer or deep skillet to 365°. Separate the onion slices into rings and dip into the flour mixture to coat. Set aside the onions. Dip the battered rings one at a time into the breadcrumbs and scoop the breadcrumbs over them to coat completely. Shake off any loose bread crumbs. 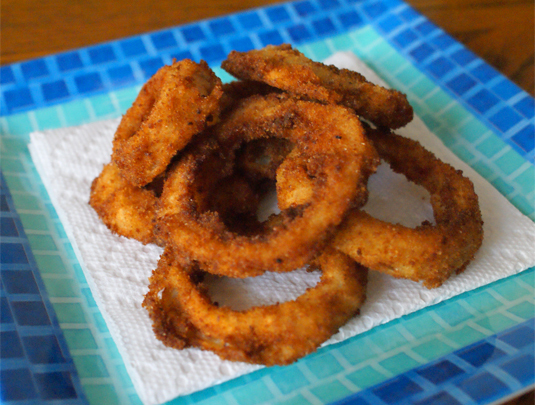 Deep fry the onion rings a few at time until crispy and golden brown, about 2-3 minutes. Drain on paper towels and season with salt. Hey, I pinned this for the Kitchenaid slow cooker giveaway. These look awesome in you pics. 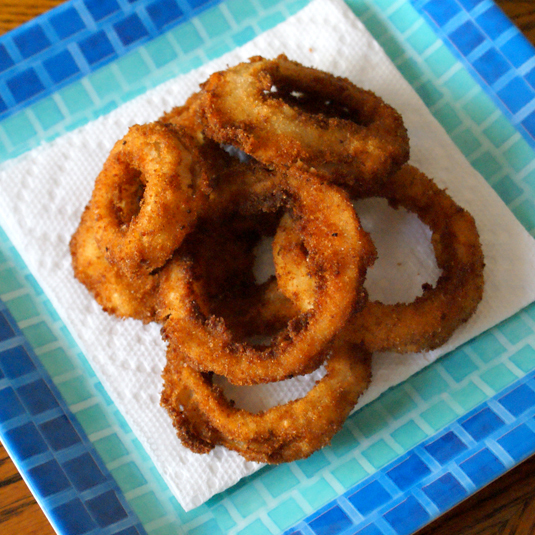 I love onion rings, and if I learn to make them at home my husband will be thrilled.